What should we wear during our photo shoot activity? What to wear is one of the most commonly asked questions and my answer is typically wear what is comfortable. That being said, with a couple or a family, color coordination is something to consider. If you visit the galleries on this site, you will get an idea of what most people wear. Generally speaking, solid colors are better than plaids and light pastels are better than dark colors. But, there are some images in which the couple, family or individual is dressed in dark clothing and it looks great. Plaid patterns, if loud and bold can become the main focal point, instead of the person, couple or family. Some plaid patterns can cause ‘moire’ which is a swirling effect. I typically suggest to avoid bold plaid patterns. Wear sandals, or shoes that can be easily removed as Maui portrait photography is often on the beach, at the shoreline, and feet, ankles and sometimes up to the legs can get wet. Is a change of clothing possible? In some locations, yes it is. Several of the beach parks used have bathrooms, and some locations are remote enough that hiding behind a palm tree can suffice. Also, ‘props’ or ‘paraphernalia’ can be added to a portrait session such as lei’s, hats, scarves, sarongs, etc. A Maui portrait photo shoot activity is not something you can do every day. It is worth some thought as to what you will wear and what you might like to include in some of the images we create. How long does a photo shoot activity last? About an hour to an hour and a half. For sunset, we begin about an hour before actual sunset, which varies throughout the year from about 5:30pm in the winter to 7:30pm in the summer. For morning shoots, the earlier the better, no later than 10am. The lighting after mid morning can become quite harsh creating very definite, and undesirable, shadows. Following the photo shoot, images are transferred from camera to computer and edited, then compiled onto a CD and mailed to you. The editing and compiling can take about a week and the mail can take about a week. You can expect to receive the CD in about two weeks from the time of the photo shoot. However, when you are notified that the CD is in the mail, you are also at that time given access to the private, password protected online gallery which you would then have available about a week after the photo shoot. Please take a look at the bottom of the Services page where our cancellation and refund policy is described in detail. The answer to that question depends a bit on whether you are a large family, a couple on their honeymoon or wedding, or an individual. There are some ideal locations for each. The two most popular locations are Kamaole III Beach Park on the south shore in Kihei and Launiupoko Beach Park on the west side in Lahaina. However, there are several other great locations. The best time of day is dependent on what you want; there are some significant differences between morning and late afternoon light, and background colors. Morning tends to emphasize the cool blue sky and white clouds whereas the later afternoon/sunset time tends to emphasize the warm oranges and reds, sometimes even purple. Sunset time is the most popular as sunset on a Maui beach can produce some spectacular backdrops for family portraits, couples or individual photography and weddings. I tend to take a lot of pictures. Any one photo shoot can easily generate 200-400 pictures, or more if a large family, group or wedding. I’d rather have more than less, and even with the compiling of edited images onto the CD, I am more liberal than conservative in which images to include. I would rather you have more choice than less. In any given compilation, which often includes well over several dozen beautiful, and sometimes stunning, images, you may find half of them to your liking and half of those again real ‘keepers.’ Because taste differs, what I may have found to be the best of the lot, you may not see them that way, and what you find the best of the lot, I may not see that way. To make sure you get the best images that you like, I include an over selection of final images. Of course, a portrait session with an individual will have less final images than a large family. But, whether an individual or a family, a party or a wedding, the collection of images you get will stand out far above any snapshots taken with a cell phone by friends. The Maui portrait photography photo shoot activity aims to provide you with images you will value long after the photo shoot is over. What is the cost of a photo shoot activity? My fees are based on number of people and time involved and may range from $400 to $800 or more if the family is very large or if multiple families or a group, such as a wedding or other events. In every instance, the fee is all inclusive and covers the photography, editing, compiling images onto a CD, mailing the CD to you and a private, password protected online gallery. For more information, visit the Rates page. What if we have several generations in our group? I typically take pictures of the entire group as well as sub-groups and even sub-sub groups. For example, a family of 5 will have pictures of all 5 as well as pictures of just the two parents, and just the three children, and one parent with all children, and the other parent with all children, etc. Posing is also a consideration with both small and large families. As a professional family therapist by profession, I am very aware of family structure and often pose a family with structural family theory in mind. For example, the mother and father, structurally, are a domain separate from the children. Parents have a different set of rules, have a higher authority, are the adults. They have a different role in the family. That can be shown in some of the poses in family portrait photography. With extended families or multiple generations, there may be pictures of the grandparents and grandchildren, or grandparents and their children. There may be several different groupings within any one photo shoot session. However, with large or multi generational families, it is a good idea to notify the photographer of any specific groupings you would like. How do you work with infants? Infants, and toddlers, can be challenging in that they don’t take directions real well; however, their spontaneous expressions can make for some marvelous once-in-a-lifetime captures. It does at times take the photographer, and the parents, being a bit silly to grab the attention of the infant or toddler to produce one of those incredible expressions infants and toddlers make, and which is then captured in the camera for years and years and years of wonderful memories. How do you deal with teenagers who don’t want to have their pictures taken? My background is in mental health counseling; I’ve worked with a lot of teenagers and know how to engage them with respect, intelligence and humor. Most teenagers like the photo shoots, they just need to forget themselves and have fun. 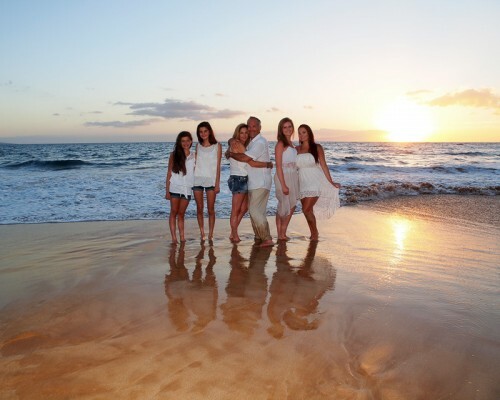 Maui family portrait photography can be a lot of fun and I aim to make it a creative collaboration. As William Shakespeare stated, ‘all the world’s a stage, and all the men and women merely players.’ I play upon the theatrical a bit and encourage teenagers to become visually expressive, which is typically what they like doing anyway. Should we wear our eye glasses if we normally wear them? Yes. However, some special considerations will be given to posing and posture to help reduce the reflections from the eye glasses. If eye glasses are only worn periodically, such as driving or reading, then some pictures can be taken with them, and some without, if so desired. The same with sunglasses; if glasses add character and personality, they can be included in some of the shots. What if it is very windy? It can get windy and although the wind typically dies down very near or at sunset, the hour prior that can be gusty at times. If you have long hair, it might be a good idea to bring along something to tie your hair back. From my experience over the years, the wind can be a moderate problem about 15% of the time, and even then, it is manageable. It has never to date been so severe as to prevent a photo shoot. If such should be the case, it is known ahead of time and we discuss rescheduling. I use modern, professional grade digital cameras and lenses for all portrait and wedding work, as well as my scenic landscape photography. A lot of the work in professional digital photography occurs in the ‘darkroom’ which in today’s world is on the computer using editing software. I currently use Adobe Photoshop & Lightroom . I also use ‘plug in’ software which are additions, like filters. These additions allow the photographer/editor to add qualities to an image that would otherwise not be possible. I typically include at least one image with a watercolor paint effect and one monochrome, or black & white, in the collection. There are other pieces of equipment which can be important in the world of digital photography. Rather than choice of film, which might have been Kodachrome, or Ektachrome, or Tri-X, the decision now has to do with memory cards, both brand and size. I always carry several with me and when on a professional shoot carry an extra camera body and lens. One of the ‘mantras’ for a professional photographer is ‘backup.’ I also use professional flash, also referred to as speedlights or strobes, and carry a backup of that as well. Do you only take color pictures? Although I only take color pictures in the camera, and there are specific settings in the camera to allow more or less vibrancy, saturation and color hue, once on the computer and in the editing software, color images can be made into monochrome, or black and white, very effectively. In fact, some of the monochrome prints made from original color files can be stunning. Of course, it depends a lot on the techniques used on the computer, not unlike the techniques used in a darkroom. I typically include one or two monochrome ‘conversions’ in the CD compilation from a photo shoot activity as monochrome images are classic and can have a timeless quality to them. Yes. Each picture is reviewed and edited for proper color balance, contrast and clarity; when shooting into the sun a flash is used, which can leave reflections on the face, in the eyes, or on eyeglasses on the cheeks and forehead, and which are removed; often surfers are in the background, and removed. Certain features, such as sunburn on the arms, legs or face, larger bruises and cuts, general size, weight and height, are not edited. I generally do not provide prints; rather, I provide you with a CD of images you can have printed at your favorite store or lab, at cost. An online gallery is part of the package you get with a Maui Island Portraits photo shoot activity, and you can order prints from the online gallery where you will find a variety of choices of sizes, photographic paper on which the images are printed, including metallic and canvas, as well as some specialty items such as cards and calendars. When printing, recognize that any one image may come out a bit different on different printers. It is often a good idea to have proofs prior purchase to ensure that the quality of the image is acceptable; if not, contact the printer and have them make the necessary adjustments. Sometimes, choice of paper can make a difference as well. What is the most important element in taking a good picture? Light, and shadow. And technical knowledge and skill. Photography is about light and shadow and the contrast between those two is referred to as ‘dynamic range.’ Many who take pictures, either professionally or casually, will note that there are plenty of times when the highlights, the bright areas are ‘blown out’ or over exposed while the shadow areas are okay; or, the highlights are okay, but the shadow areas are all too dark. Modern cameras have a limited dynamic range and though quite good, and getting better and better, it does not quite equal the human eye, and especially the natural compensation and extrapolation which occurs in the human brain. Still, as a photographer, whether taking portraits or scenic landscapes, an eye for light and shadow is, perhaps, the most important element, followed by ‘composition.’ Technical knowledge and skill comes into play when knowing how to create a shallow depth of field in the given lighting situation or how to best expose for contrast or low light situations. For environmental portrait work, especially at sunset, one of the more important elements is balancing the ‘ambient’ or natural light of a sunset, with the output light of a flash to illuminate the subject in such a way that it looks natural with a sunset in the background. A quality professional photograph takes into account a lot more than modern advertising would have you believe; owning the newest most up-to-date camera with which you can get professional results, doesn’t necessarily mean you will. Knowledge of that tool and skill in using is it still makes a big difference. Journalistic, for the most part. During the ceremony (and just prior), I move around, as unobtrusively as possible, capturing the moments that make up the wedding ceremony from different angles, capturing the expressions, the joy, the love, the tears, the smiles. Special attention is placed on those unrepeatable moments of exchanging rings, and the kiss. Following the ceremony the style shifts to more established portraiture taking pictures of the bride and groom, now husband and wife, the wedding party, bridesmaids, best man, etc. The photo shoot is concluded with some special romantic shots of the newlyweds. What is the best place for a wedding on Maui? The beach. At sunset. There are several excellent locations for on-the-beach-wedding ceremonies. One of the most popular, and one which you can see in the galleries, is Makena Cove, aka Wedding Beach, a small, private little beach bordered by lava rock. On any given afternoon, one may find two or three weddings going there. Other beaches are also well used for weddings. Polo Beach is another popular spot for weddings. What are some special considerations for wedding photography? Backup. A professional wedding photographer will always have back up equipment. They will have two cameras, several lenses, several batteries and memory cards. If they are using flash, and most do, they will have at least one back up. Some photographers will even have a back up photographer. It is also important to talk with your photographer about what you want in your Maui wedding photography. After all, this is a once-in-a-lifetime event. From the photographer’s point of view, some important considerations include location, time of day, lighting, number of people, relationship of guests to bride and groom, special instructions from the bride and/or groom regarding what and who to photograph with whom and if the permit has been acquired. 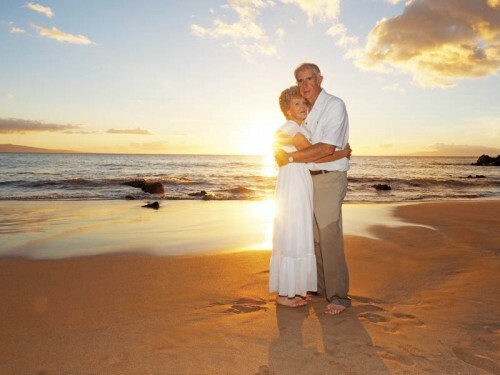 Maui beach weddings is a rather big business and permits are required for beach wedding ceremonies and can be acquired through the wedding officiant.